Each year CAIMS/SCMAI hosts an annual meeting for all members. This meeting is one of the central activities of CAIMS and has been held for over 30 years. The annual meeting covers all areas of applied and industrial mathematics with high profile speakers invited to give keynote addresses on currently active thematic areas. 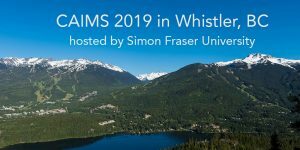 The Annual Meeting of the Canadian Society of Applied and Industrial Mathematics (CAIMS 2019) will take place at the Whistler Conference Centre in Whistler, British Columbia, from June 9-13, 2019. We have reserved a block of rooms at the Delta Hotels Whistler Village Suites at a very attractive rate. Please use this link for the conference rate and make your reservations as soon as possible while rooms are still available. Most participants will fly into YVR International Airport. You can book transportation from there to Whistler Village at the Whistler Shuttle site. Whistler Shuttle will track your flight, and meet and greet you at the airport. To catch a same-day shuttle to Whistler please plan to arrive before 8pm PDT. Another provider is Skylynx; please check departure times. Alternatively you can rent a car at the airport. The drive from the airport to Whistler is a little over 2 hours, depending on traffic. **includes CAIMS membership until December 2020. Conference registration includes one banquet ticket (only available to the first 160 registrants), Welcome Reception, coffee breaks, and wireless Internet access at the conference venue. Note: You should automatically receive a confirmation email when you finish your registration. We have been notified that some university email systems treat this confirmation email as spam and block it. Please contact us if you did NOT receive confirmation after registration. If you like to submit a contributed talk or poster, please use the submission form below. Participants who have been invited by organizers of mini-symposia, please use the same submissions link. Please refer to the deadlines for submission below. The result of the PIMS travel support will be announced in late April. Due to the high response rate, we cannot fund researchers who do not plan to present at this conference. Please download the template for abstract submissions. Your completed abstract should look like this sample. Then submit your abstract here. Hotel reservation by April 14, 2019. Abstract submission for mini-symposia closes on April 30, 2019. Abstract submission for the contributed session is closed. Conference runs June 9-13, 2019. 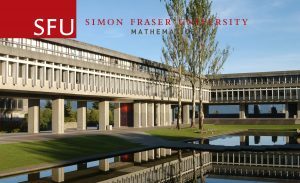 The local organizers are Weiran Sun and Manfred Trummer from the SFU Mathematics Department. Please feel free to contact us with questions and suggestions.